For the past 12 years EcoBrokers has been educating real estate agents about environmental and energy efficiency issues with rigorous and intensive training courses leading to becoming a Certified EcoBroker. We are not talking about a Green designation covering the headlines and looking at environmental issues. We are talking about real expertise in guiding clients with truly professional advise on making their homes environmentally sensitive and cost efficient through energy efficiency and the use of renewable energy. 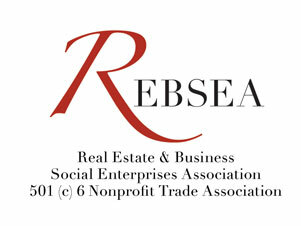 REBSEA considers EcoBrokers to be a true Social Enterprise. In the course of their real estate business Certified EcoBrokers are Giving Back to their community the social benefit of enhanced environmental awareness and energy efficiency knowledge. We are honored to count Certified EcoBrokers among the initial Founders of REBSEA. We encourage all of the real estate professionals who are a part of REBSEA To visit their website at EcoBroker for complete information about the services they offer and to consider increasing your knowledge and enhancing your brand by becoming a Certified EcoBroker. We will be covering certain subject matter provided by EcoBrokers in future issues of your newsletter.